Cutting to the chase – this is one of the most exciting new releases I have heard in the last 20 years. Fresh, different, boundary-busting, it delivers a high level of artistry and complexity deceptively packaged in a group of irresistibly catchy songs. In the realm of smooth jazz music there are musical archetypes that most releases fold safely into. That’s a kind way of saying that there are a lot of soundalikes out there. Music writers and radio programmers soldier through stacks of CDs and digital press kits hoping that something will jump out of the pack and grab you right between the ears. If you’re persistent and keep digging a killer song will jump out of the pack. About 20 CDs in and close to succumbing to ear fatigue one did that for me. It was “In The Bag” by an indie artist named Dean Mongerio. No album yet and I had never heard of him. It was commercial in the best sense of the word – solid melody, energized playing, and tight. What stood out is that Mongerio is so completely in his own voice even on a song that has the familiar feel of a Rippingtons or Richard Elliot track. 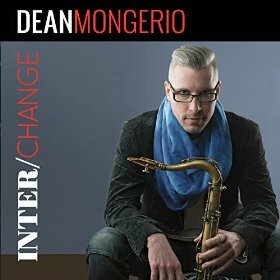 Inter/Change came out a few months later and affirmed that this is an artist who has defined his own turf as an instrumentalist, composer and producer. It’s a wide piece of turf too, and he and his band go all out on every piece of it. Of course “In The Bag” turned out to be an ear grabber. It’s a songwriting collaboration between Mongerio and Khristian Dentley, the newest member of Take 6. It packs a lot of wallop for a song that clocks in at 3 ½ minutes and is a perfect lead in to the more complex and fusion flavored “12th Day.” That one builds momentum from the starting sax line with Mongerio and guitarist David Preston’s instrumental interplay powered by a solid performance from the rhythm section. “Tony Que” has a Latin jazz vibe and showcases Anton Castillo on piano. Mongerio shifts gears from a tight melody line to some absolutely off the hook soloing. The title track starts with a tease, Mongerio running his sax through some funky, distorted effects. Then drummer kicks in and the rest of the band for an angular jam that reminds me of Chick Corea’s Elektric band. It’s not all flash and fusion though. The ballads have substance, emotional power, and irresistable melodies. “Reflections” is hauntingly gorgeous “Take Me Home,” has a hook that will stick in your head and elegant sax and piano interplay. “Orpheus,” with its retro keyboard textures and flowing melody line updates the mellower side of late 70s fusion. Then there is “The Annswer,” which I played repeatedly for several days. It’s one of those songs that has so many layers, so many changes, and creates such a mood that you can immerse yourself in it. Graceful, meditative with Metheny-ish undercurrents, this one is gorgeous and introspective with some dazzling solo work from the band and Mongerio playing in a lower range that adds even more of an adventurous vibe to the song. I can’t say enough about the group of musicians he as put together for these sessions. He’s across the pond, in London, so you may not be familiar with the names on the liner notes. That’s refreshing in itself and to say Anton Castillo, Kevin Glasgow, Nathan Williams, and Luke Harris bring it would be an understatement. They get a lot of room to stretch out and show their major skills through a set of songs that sound so different from each other. They can play smooth, they can play progressive, they can play funk, they can play fusion, they can play jazz. Skill, diversity and songs that stick in your ears and your head. This is an album that doesn’t sound like anything else out there. It doesn’t make the demand that you expand your musical horizons. It makes you want to get more adventurous. And that is a beautiful thing.